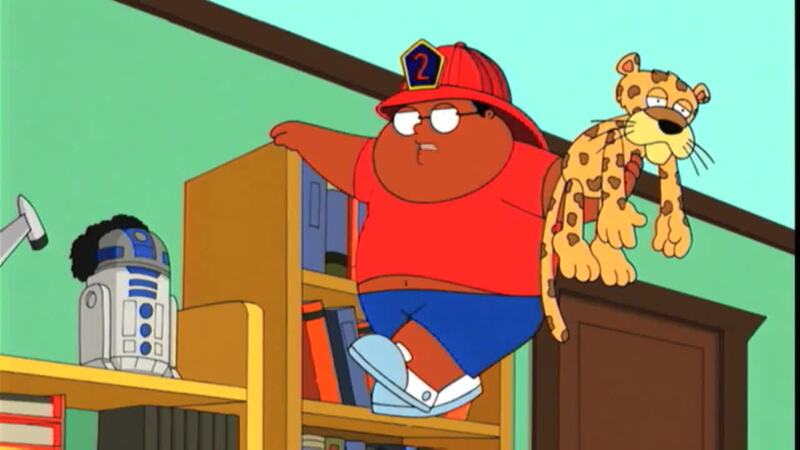 Larry the Leopard is Cleveland Brown Jr.’s imaginary friend. With a relationship bordering on the creepy (ie. Larry is sometimes portrayed as Junior’s spouse), Larry is an important part of his owner’s life. Junior practically has a nervous breakdown when Larry is put through the washer and dryer, taking away his essence or as it is more filthily known, his stank. Cleveland Sr. is not a fan of the stuffed animal and its effect on Junior, who takes advice from the inanimate object. It seems at times as if Teddy is the only person Mr. Bean cares for… although Bean’s use of Teddy in his palns often results in punishment to the bear. The two exchange Christmas gifts, Mr. Bean makes sure Teddy is safely buckled in while driving, and the bear is given its own bed. Teddy became such a popular character in the series, that Ty (makers of Beanie Babies) produced a replica, so fans of the series could have their own adventures with the stuffed bear. 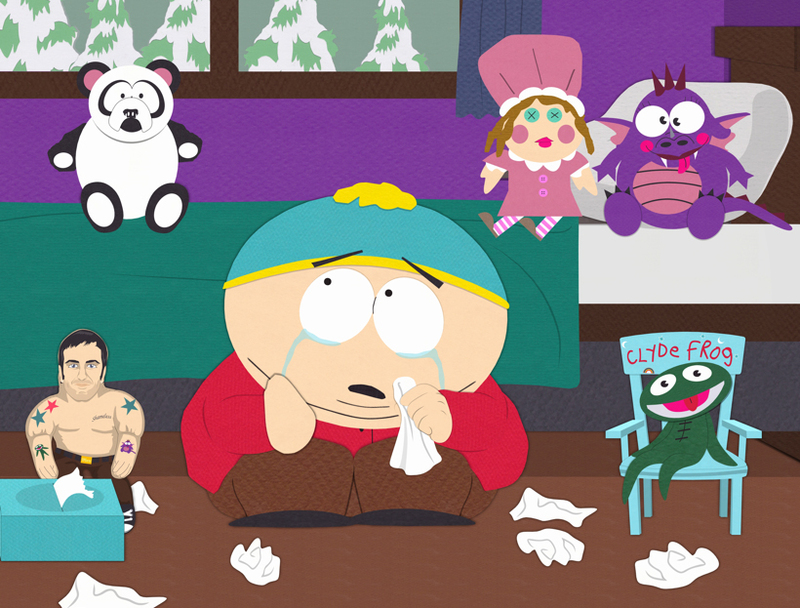 Cartman has a whole collection of stuffed toys that become his imaginary friends (also including Polly Prissypants, Peter Panda, and Muscle Man Marc), joining him for tea parties and otherwise filling in for Cartman’s lack of a father. When Cartman is finally ready to grow up and leave behind his plush friends, they are all murdered in a twisted, schizophrenic fashion with Cartman as the culprit and his childhood toys as the victims. While Rupert seems like an innocent enough stuffed bear, when Stewie imagines the two of them cavorting together in his fantasy world, Rupert becomes a muscled man (save for his teddy bear head) is skimpy speedo shorts. There are many other insinuations that Rupert is gay, likely playing off of Stewie’s own ambiguous sexuality. Stewie losing Rupert or moving on from the toy has been used in a couple of episodes, but the bear always winds up back in the crib. Like the other stuffed animals on this list, Hobbes becomes an imaginary friend to his owner, in this case Calvin. The two get up to all sorts of trouble together with Hobbes trying to be the voice of reason, but often being ignored. Artist Bill Watterson blurs the lines of how real Hobbes may be with events like Hobbes being regularly tossed in the washing machine, which are baths that the tiger is forced to deal with. Honourable mentions go to Winnie the Pooh, Ted, Pookie (Garfield), Smacky (Get Fuzzy), Mr. Bear (Full House), and Bobo (The Simpsons). What’s your favourite stuffed animal from the entertainment world? It’s time to get cuddly! 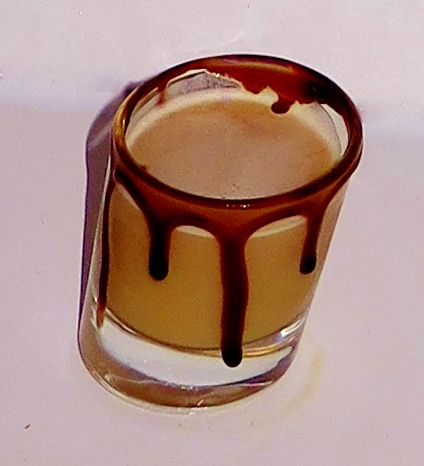 This shot was pretty good, reminding me of a Cola float… and how could you go wrong with that! The Chocolate Syrup rim took me back to the days of stuffed animals with early morning cartoons and chocolate milk. You know, the good ol’ days!